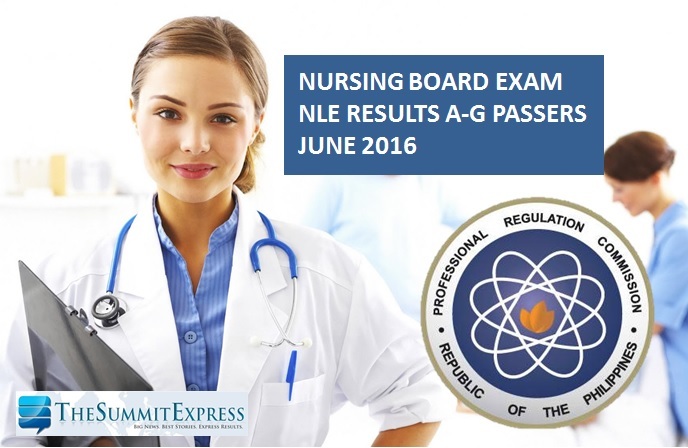 MANILA, Philippines - The June 2016 nursing board exam (NLE) results are out online today, June 17, 2016 after 9 working days from the last day of exam. A total of 6,183 out of 14,184 hurdled the NLE given on June 5 and 6, 2016. The Board of Nursing (BoN) conducted the NLE in various testing centers nationwide: Manila, Bacolod, Baguio, Cagayan de Oro, Cebu, Davao, Iloilo, Legazpi, Lucena, Pagadian, Tacloban, Tuguegarao and Zamboanga. The complete list of passers in alphabetical order (A-G) surname is now available here. Those who will register are required to bring the following: duly accomplished Oath Form or Panunumpa ng Propesyonal, current Community Tax Certificate (cedula), 1 piece passport size picture (colored with white background and complete name tag), 2 sets of metered documentary stamps and 1 short brown envelope with name and profession and to pay the Initial Registration Fee of P600 and Annual Registration Fee of P450 for 2016-2019. Successful examinees should personally register and sign in the Roster of Registered Professionals.